Receptiveness to financial astrology is not limited to countries rich in superstition such as India. The discipline also has a following in developed countries like the UK and the US. In fact, one of the leading UK-based financial dailies recently reported, financial astrology is “growing in popularity and complexity”. Investment decisions are personal and complex, with priorities, risk preferences and timelines varying for different investors. Hence, when making high pressure decisions about how to invest their hard-earned cash – individuals act in ways that are based on emotion, gut instinct or superstition, pointed out a report by Morgan Stanley Institute for Sustainable Investing, this February. Soumitro Banerjee, Professor, Indian Institute of Science Education and Research, Kolkata, scoffed at such unrealistic practices. “Astrology is an unscientific belief that originated when people did not know how to manage uncertainties,” said Banerjee. He further pointed out that in today’s world uncertainties can be countered through hi-tech solutions and processes. Banerjee’s indication is towards growth of data-based analysis and mathematical and algorithm-based decisions while making an investment. Countering this thought, Delhi-based Vedic financial astrologer Ridhi Bahl explained speculation is a mind game and cosmic powers influence our thoughts and actions. “This is called luck or X factor and astrology gives a justifiable reason using mathematics,” said Bahl. Kolkata-based financial astrologer Sankar Bhattacharjee, meanwhile urged nay-sayers to “experience it first before rejecting the role of astrology in financial investments.” For the past three decades, he has guided many people in making their investment choices. “Even science was considered as superstition till it proved its theories,” defended Bhattacharjee. Financial astrologers claimed that movements of different planets (especially the Moon) influenced high and low tides of different intensities and magnitudes in different time frames--daily, weekly, monthly and yearly. These timings can be predicted, much in advance, precisely in minutes. “It is not a matter of belief anymore. It is highly scientific. Just like we have tides in the oceans, we have waves in stock markets too. These waves in the stock markets can be predicted through financial astrology, which is a spiritual science which is linked to advanced astronomy,” said Satish Gupta, another Delhi-based astrologer. But if astrology can guide investment decisions, why do people still lose money? “Moon is relatively close to the earth and it does impact water bodies and its effects can be explained. But all other planets are far off and to calculate their actual effects on earth’s particles one has to do it with 10-90. It means their effect is so slight that it is not possible to predict anything using such calculations,” Banerjee further cited in his arguement. Financial astrologers believe the opposite. They claimed that they were able to predict market volatility and also warn investors in advance. “I warn investors with monthly, quarterly and annual charts based on their horoscope and match it with the planetary positions of the sector they have invested in. In fact, I could help many investors when the Harshad Mehta scandal shook the markets in 1991-92,” claimed Vinod Rawal, a Mumbai-based financial astrologer. However, they add a disclaimer that the investors have to have belief in such predications and act accordingly. “Timing is most crucial in successful investments and tradings. This timing can be known only through a divine science called financial astrology,” said Gupta. 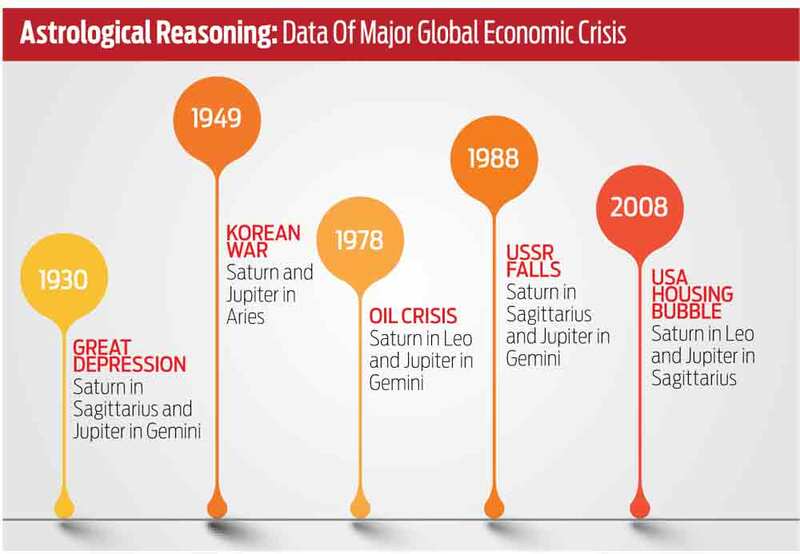 The transit of Saturn and Jupiter plays an important role in predicting financial trends, claimed Bahl. She presents her argument with the support of classical astrological texts and claimed that when Saturn transits through Aries, Leo and Sagittarius without the influence of Jupiter, then it might result in drought, scarcity of food and wars. According to her, India’s astrological chart on November 8, 2016, when demonitisation was announced, shows Saturn formed a near 120 degree alignment with Scorpio and Venus in Cancer. Further, Mars and Moon were in opposite directions and Rahu sat on Leo. These combinations lead to a volatile financial situation in the country, claimed Bahl. 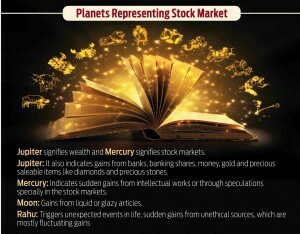 The stock brokers, financial planners and fund managers that Outlook Money spoke to refer to astrological predictions as a diversion from basic logic or reasoning. 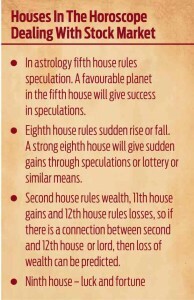 Shankar Chari, a Chennai-based financial analyst tries to rationalise the use of astrology in investments. “If we keep the finance industry and analysis aside for a few minutes, there is a possibility to assess some science behind the idea of superstition or call it a lucky charm or performance enhancer,” he added. 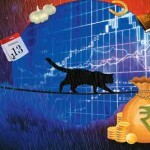 However, Anurag Garg, Founder and CEO, Nivesh.com, feels, when it comes to long-term investments, it is not prudent to take decisions based on astrology or any other superstition. “Belief in a system is a personal choice but anything that does not depend on practicalities and basics of investing is not desirable,” said Garg. Gupta argued that stocks of astrologically-supported sectors give exorbitant gains irrespective of the broader market being bullish or otherwise. Every year with the commencement of new Samvat (Hindu New Year), certain new sectors start outperforming, while some other sectors which were performing well earlier start under-performing and for some sectors, stocks remain laggard. Astrology pitches in as the true science to decipher these developments. “No fundamental, technical analyst can catch this sector rotation. Financial astrology is the missing science here and that’s our core domain,” challenged Gupta. 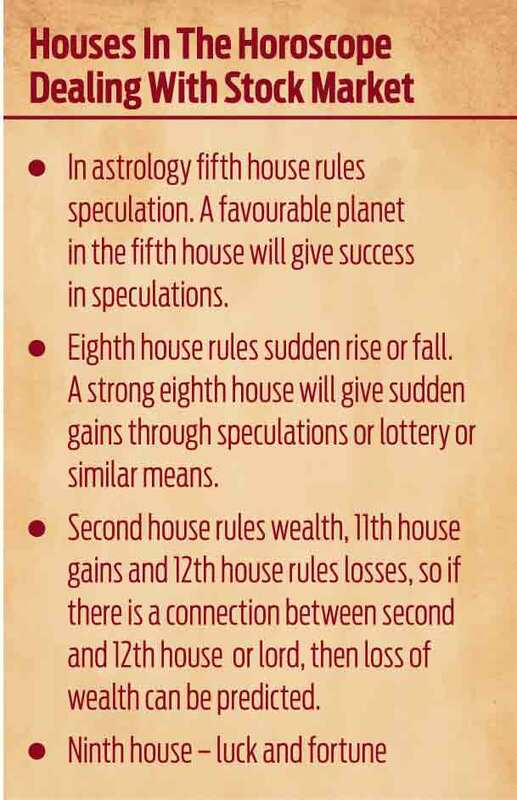 Morgan Stanley’s report aptly sums up the entire dichotomy between superstition and also the use of astrology for investment decisions as against well-researched data. “Even if we accept the research as solid fact, no level of confidence or self-belief, brought about by any mystical aid has the ability to bend the stock markets in an individual’s favour…human mind devoid of expertise and experience is apt to stumble when confronted with an area of complex decision making, such as investing,” the report stated. This is the truth behind every individual’s investment decision, but none will admit it in the open.